Since 2007, we’ve been reminding our readers of this event that takes place only twice a year. Twice a year, an exceptional event occurs: the sun is very precisely geographically positioned just above the Kaaba. Explanations. Qibla. Everyone knows that, for each ritual celebration, Muslims around the world turn towards the direction of the Kaaba, located in Mecca (Saoudi Arabia). This direction to Mecca has a name: the qibla. 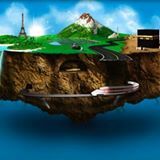 Twice a year – on May 28th an July 16th, an exceptional event occurs: the sun is approaching the zenith of Mecca to find over the Kaaba. At every moment, the Sun runs above our heads. So that it would be possible to establish a path and even a virtual route on land, as if traveling on. The Sun’s position is such as it systematically corresponds to a geographically localized place on earth. Imagine that the Sun is a ball whose shadow is cast on the ground. Well, we could draw the path taken by the shadow and locate, depending on the time of day, some places on earth simply by looking at the Sun, provided that these places are located between the two tropics, as it is the case for Mecca. This is particularly interesting for Muslims. Both Dates to remind are May 28th and July 16th of each year. On these dates, the Sun is actually above Mecca, and more precisely above the Kaaba. On May 28th, the sun will be at this position at 9:18 am GMT. A month and a half later, the Sun always returns precisely above the Kaaba, on July 16th, at 9:27 am GMT. In order to know the time of the country you live in regarding to GMT, you can visit this website: http://www.greenwichmeantime.com. This is the opportunity for everyone to confirm or correct the direction for each prayer. In 2007, an Al-Kanz reader indicated that this event allowed him to see that he had been praying for months in the opposite direction. He had moved to a new city and had turned toward the wrong direction without being aware of it. 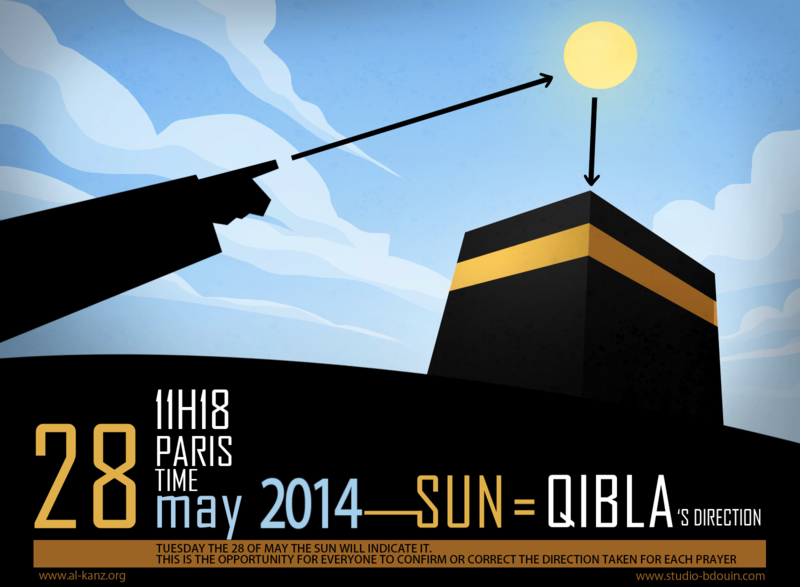 In order to know exactly where the qibla is, all you need to do is look where the Sun is at 9:18 am GMT. If heavy clouds prevent you from seeing anything that day, repeat the next day or the day after. The Sun will almost be in the same position. We need to specify one last point: no need to cry foul in your mosque under the pretext that the qibla is not to close the graph indicated by the position of the Sun. It is acceptable that the qibla is somewhat shifted. This event takes place twice a year. So do not miss it, especially if you appreciate to check for yourself the accuracy of the qibla adopted. That is why we’ve been inviting you since 2007 to relay the information: Facebook, Twitter, blogs, emails, mailing lists you subscribe to, forums you attend or SMS. This rare moment is stirring. Each year, many are those satisfied and relieved to know they pray in the right direction, and also touched by the idea that, at this time, other Muslims are in the act of worship, in the tawaf (circumambulation). So spread the word, you should make some people happy. Remember to set an alert on your mobile phone and your family’s alarm clock. Or stick a post-it on your fridge and talk to your friends about it. And on the day, just come and tell us if you’ve been able to see the sun and check the qibla. Note that this is valid for two days before and two days after that date. So the 26, 27, 29 and 30. Congratulation to Studio Bdouin for achieving the visuals.